If you are Johnnie, please join here and update your profile! As the ship on which Seaman First Class Hutchins was stationed approached the enemy-occupied beach near Lae, New Guinea, under a veritable hail of fire from Japanese shore batteries and aerial bombardment, a hostile torpedo pierced the surf and bore down upon the vessel with deadly accuracy. In the tense split seconds before the helmsman could steer clear of the threatening missile, a bomb struck the pilot house, dislodged him from his station, and left the stricken ship helplessly exposed. Fully aware of the dire peril of the situation, Hutchins, although mortally wounded by the shattering explosion, quickly grasped the wheel and exhausted the last of his strength in maneuvering the vessel clear of the advancing torpedo. Still clinging to the helm, he eventually succumbed to his injuries, his final thoughts concerned only with the safety of his ship, his final efforts expended toward the security of his mission. Johnnie David Hutchins (August 4, 1922 – September 4, 1943) was a United States Navy sailor and a recipient of the United States military's highest decoration—the Medal of Honor—for his actions in World War II. He enlisted in the Navy from Houston in November 1942. Hutchins, aged 21 at his death, was buried in Lakeside Cemetery, Eagle Lake, Texas. For extraordinary heroism and conspicuous valor above and beyond the call of duty while serving on board a Landing Ship, Tank, during the assault on Lae, New Guinea, 4 September 1943. As the ship on which Hutchins was stationed approached the enemy-occupied beach under a veritable hail of fire from Japanese shore batteries and aerial bombardment, a hostile torpedo pierced the surf and bore down upon the vessel with deadly accuracy. In the tense split seconds before the helmsman could steer clear of the threatening missile, a bomb struck the pilot house, dislodged him from his station, and left the stricken ship helplessly exposed. Fully aware of the dire peril of the situation, Hutchins, although mortally wounded by the shattering explosion, quickly grasped the wheel and exhausted the last of his strength in maneuvering the vessel clear of the advancing torpedo. Still clinging to the helm, he eventually succumbed to his injuries, his final thoughts concerned only with the safety of his ship, his final efforts expended toward the security of his mission. He gallantly gave his life in the service of his country. Johnnie Hutchins was serving aboard USS LST 473 at the time of this action. Hutchins and seven other shipmates were killed in action and fourteen others were seriously wounded. 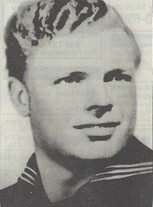 USS Johnnie Hutchins (DE-360) was named in his honor. The ship was laid down March 6, 1944 by Consolidated Steel Corp., Ltd., Orange, Texas; launched May 2, 1944; sponsored by Mrs. Johnnie M. Hutchins, mother of Seaman First Class Hutchins; and commissioned August 28, 1944, Comdr. H. M. Godsey in command. Johnnie Hutchins changed his profile picture.